. . . you preach your first chapel sermon. In addition to preaching an occasional sermon, preseminary majors like Phil concentrate on the biblical languages, Greek and Hebrew. They also study history and literature, math and science and PE. And some study other languages as well: maybe German or Latin, Spanish or Chinese. And of course they play sports and sing in choirs and act in plays and belong to clubs—all the ingredients of a great college experience! 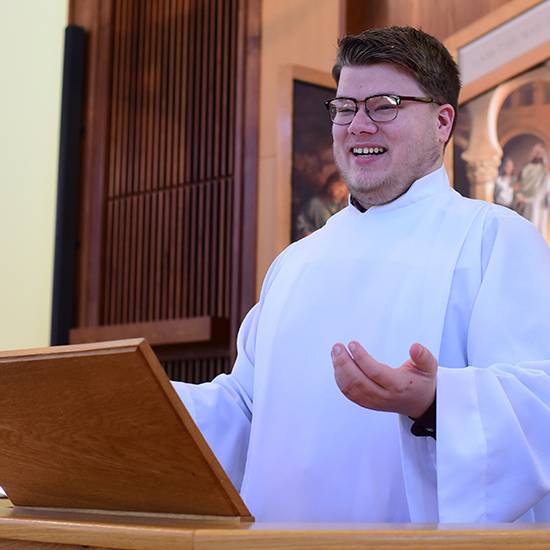 It’s just the kind of preparation they need to move on to Wisconsin Lutheran Seminary, where they will continue their pastoral education. https://mlc-wels.edu/admissions/wp-content/uploads/sites/23/2018/08/Phil-Waldschmidt-1.jpg 550 550 Leah Matzke https://mlc-wels.edu/wp-content/themes/mlc/images/mlc-logo.png Leah Matzke2018-08-28 19:39:572018-08-29 10:13:18. . . you preach your first chapel sermon.
. . . you take selfies with Martin Luther. . . . you’re chosen by the Milwaukee Brewers to sing the national anthem.